A few weeks ago our operating group had a tree making clinic at one fo the member’s home. We tried our hand at making many different sytles of trees using a number of methods. I took a “shining” to the wire armature method. This method uses florist wire (28 gauge) with twisting and forming the wire to make the armature. Unfortunately, we didn’t have any gesso to coat the bare wire armatures to continue the process so I couldn’t create the finished result. When I got home I made a few armatures with the intent of coating them with gesso. When I went to my local craft store to purchase the gesso I was surprised to find out how costly it is. Instead of purchasing the gesso I made a poor man’s version using white glue, a dash of gray liquid concrete colorant, and a secret (all purpose flour)thickening agent. I applied the mix to the armatures with a brush. The nice thing about this glue mix is that I can “set” it with a hair dryer in about 2 minutes and then apply a second coat. The mix also lasts well without drying as I’ve been using the “tub” of it for 10 days and it still it very usable. I’ve heard of possible “bug” problems using flour; however, the trees are painted which should seal them against attack by insects. After the final coat (usually two coats are required) drys I use a hobby knife to scratch the trunk to simulate bark and then dry brush the entire armature with a gray craft paint. The foilage is Wood Scenics(tm) green poly fiber is stretched thin and attached with Hob-e-Tac(R). The fiber is misted with hair spray and sprinkled with coarse green foam. These are intended to be forground trees, mainly because of how long it takes to make them which is about an hour each (ouch!). 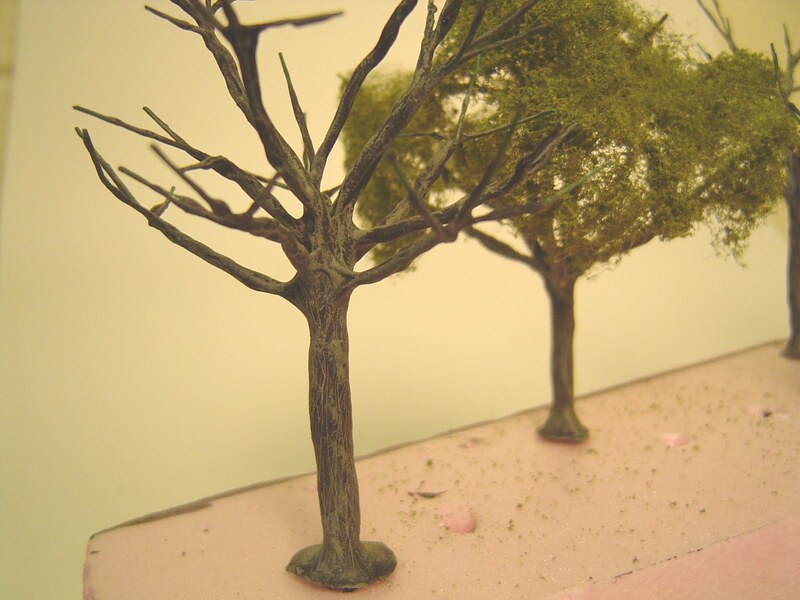 Making these trees is a “TV Time” activity for me mainly at night. The good news is the trees cost little to make and I believe they look good. Click on the pictures for a larger view. I have done trees almost same way but i have mix 50% white glue and 50% wood putty of different color depending the final color of the tree. The mixing of the white glue will make the tree flexible but will give a shining look not problem use some fine sand paper and the final product will look almost real . 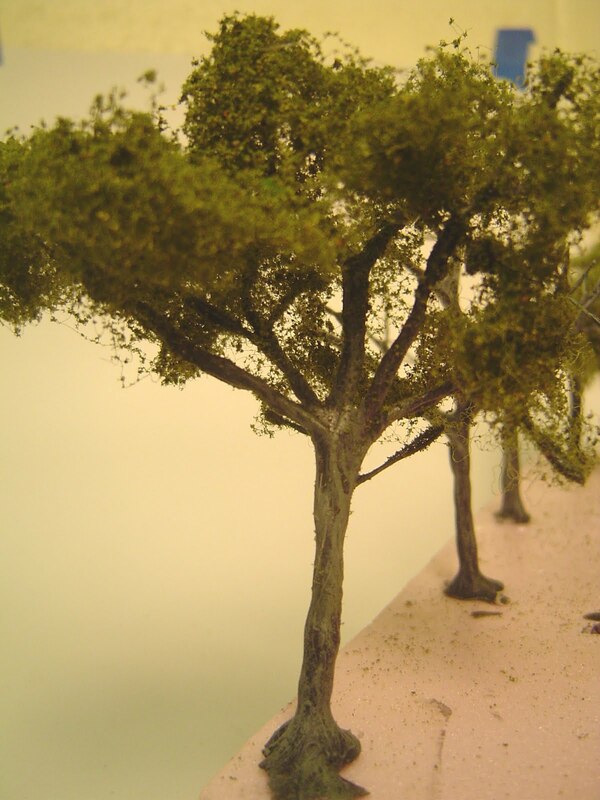 Thank you for sharing your experience on making trees. I like the idea about mixing white glue with wood putty. I’ll have to give that a try. Real gesso is actually rather simple to make, and modelers most likely have all the ingredients already. The filler material is slaked plaster: mix water and plaster in a 2:1 ratio (as long as there is more water than plaster); let sit overnight. The sediment at the bottom is slaked plaster that will no longer bind on its own. Take this plaster, mix with a binder and optionally a color. Matte medium is good for this, but any type of glue should do. The result is gesso. Artist’s gesso is expensive because it is processed to a uniform consistency and is usually very fine stuff. I think I paid $19 for a pint of black gesso last week. For painting, it’s fun to make your own, but it’s worth the cost of the commercial product. For modeling, you don’t need the quality of the artist product. Fantastic trees, by the way. I can’t wait to try it myself. 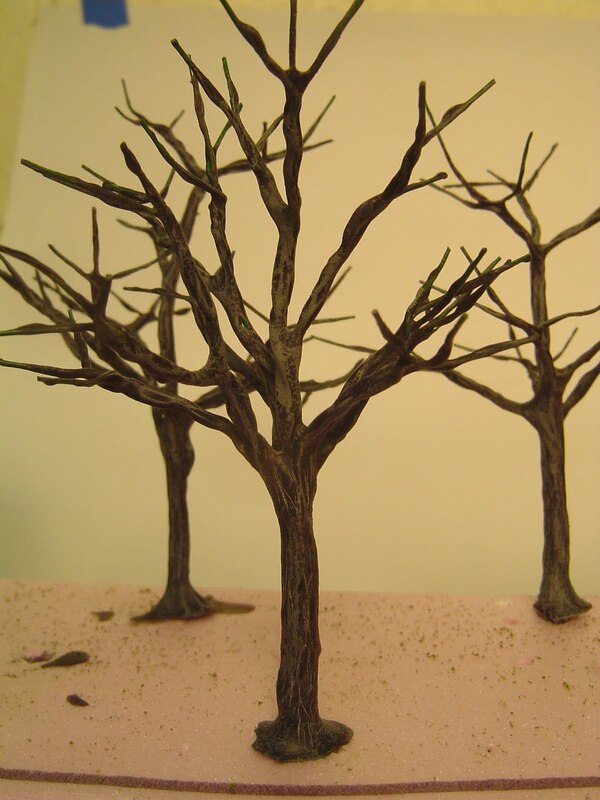 Thank you for that excellent hint on making gesso for model RR work – especially for coating wire tree armatures. I’ve tried a number of items to coat the armatures including hot glue and a mixture of flour and white glue and haven’t been happy with them.